This report on the global automotive composites market has been developed to serve as a reliable business tool for its targeted audiences such as manufacturers of automotive composites, suppliers and distributors of raw materials, end-users, and industry associations. Compiled by a group of professional and experienced research analysts, this report provides in-depth assessment of individual market dynamics such as driver or restraint, elaborates some of the latest trends, segments it on the basis of material type, manufacturing process, and composite components to represent the lucrativeness of smaller aspects, evaluates the potential of the market in various regions, and profiles some of the major companies in order to represent the competitive landscape. The report also contains Porter’s five forces analysis, highlighting bargaining power of buyers and suppliers as well as threat of new entrants and substitutes. This research report is a product developed by a combination of experienced market research analysts and is a summation of primary and secondary research, conducted specifically to understand and arrive at trends before using them to forecast the expected revenue of the global automotive composites market. A major chunk of our research efforts depended on information collected from in-depth interviews and discussions with a number of experts of the industry as well as opinion leaders. On the other hand, the secondary research for the development of this report included study of company websites, press releases, annual reports, investor presentations, various international and national databases. The logic behind the secondary research was for the report to provide qualitative and quantitative estimated market size in terms of US$ Mn for each material type, manufacturing process, and composite components. In addition to that, the report provides estimated market size in terms of US$ Mn for various geographic regions for the period 2017 to 2022, considering the macro and micro environmental factors. To evaluate the revenue generated from each product, the report has considered their launch date in the market, customer acceptance, price of the product, volume sales, trends in industry, and adoption rate across all the geographies. 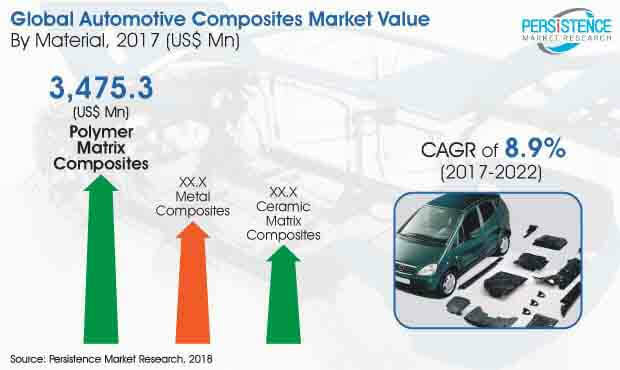 Based on composite materials, the PMR report segments the market for automotive composites into polymer matrix, ceramic matrix, and metal matrix. On the basis of manufacturing process, the market has been bifurcated into injection and continuous process, compression process, and manual process. The market has also been categorized on the basis of composite components, into engine and drivetrain components, exterior, and interior. The report evaluates the potential of the automotive composites market in the regions of North America (The U.S. and Canada), Europe (The U.K., Germany, France, Spain, Italy, and Nordic), Latin America (Brazil, Argentina, and Mexico), Asia Pacific (India, China, Japan, Malaysia, Singapore, Thailand, and Australia), and The rest of the World. The size of the market and its forecasted valuations for each of these regions as well as the mentioned countries have been given for the period from 2017 to 2022, along with their independent CAGRs for the forecast period from 2017 to 2022, considering 2016 as the base year. The research study also covers the competitive scenario in these regions. On the back of depleting fossil fuel resources and growing awareness regarding the pollution caused by it, a revolutionizing trend in the automotive industry is energy efficiency. Composites, which essentially are composition of two of more constituent materials, form a substantial part of an automobile and, if smartly used, can lead to significantly lighter vehicles that are safer and more fuel-efficient. Composed of high-performance fiber such as glass or carbon - composites are tipped to even replace steel from the automotive industry in the near future, and the market for the same is flourishing. According to this business publication, the demand in the global automotive composites market will expand at an impressive CAGR of 8.9% during the forecast period of 2017 to 2022. Revenue-wise, the analyst of the report has estimated that there will be opportunities worth US$7,019.7 million to be made out of the automotive composites market by the end of 2022, considerably more than the market’s evaluated valuation of 4,589.7 million in 2017. Moving over thermoset-based composites, thermoplastic-based composites are now being developed that offer the automotive industry several benefits such as reduced material scrap, zero-solvent emissions, reduced number of painting steps, safer worker conditions, and greater recyclability. Apart from these striking benefits, the global automotive composites market is gaining further traction from governmental regulations to produce lightweight materials and relentless research and development activities to devise improved composites. On the other hand, high cost of production and lack of technological advancements in highly profitable region of Asia Pacific are a few restraints obstructing the automotive composites market from attaining greater growth rates. Material-wise, the automotive composites market has been segmented into metal matrix, polymer matrix, and ceramic matrix. Among these, the demand for the segment of polymer matrix composites is anticipated to expand at most prominent rate during the forecast period of 2017 to 2022, and attain a valuation of US$5.29 mn by the end of 2022. On the other hand, the metal matrix composites segment is second most profitable, projecting it to reach a valuation of US$1.2 bn by the end of the forecast period. On the basis of Composite components, the market has been classified into exterior, interior, and engine and drivetrain components, whereas on the basis of manufacturing process, the market for automotive composites has been bifurcated into manual, compression, and injection and continuous. Geographically, Asia Pacific is the most lucrative region by a long margin. Driven by the emerging economies of China, India, and Japan, the Asia Pacific automotive composites market has lured several key players into its region and is providing for both production facilities as well as strong demand. By the end of 2022, Asia Pacific is anticipated to provide for more than half of the overall demand for automotive composites. However, Europe is another region with potential for profits, gaining traction from stringent industry regulations against CO2 emissions. A number of prominent automotive manufacturers hail from this region and consequently, there is availability and adoptability of latest technologies. The report also gauges the quantity of demand that can be expected out of North America and the Rest of the World. In addition to that, a number of leading players have also been profiled, representing the competitive landscape.